Once revered as a symbol of death by ancient Greeks, and surrounded by much superstition, parsley was not always appreciated as a culinary ingredient. Today, it is considered one of the most popular garnishes in European cuisines. This mild and subtle herb complements most flavors it is put with, adding color and a visual appeal to many foods without any dominating effect. A tasty addition to Middle Eastern appetizers, beans, taboulleh, couscous and stews. 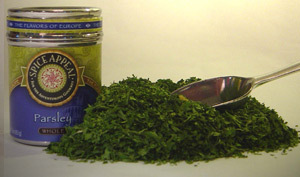 Add a dash to any European soup, sauce, fish, meat and poultry dish. Goes well with omelets, scrambled eggs, mashed potatoes and pasta.